Welcome to CAHA′s home on the web! Capital Amateur Hockey Association (CAHA) is a local youth hockey organization in Central Ohio that strives to provide a great hockey experience for all youth hockey players – from beginners to experienced players. We offer house, select and travel programs for boys and girls ages 5-14. Founded in 1967, CAHA’s goal is to offer the proper instruction of ice hockey fundamentals, as well as to create an environment for the young athletes to continue developing athletic skills. As a non-profit organization, CAHA is a member association of, and is governed by, the rules and regulations of USA Hockey and MidAm Hockey. CAHA offers programs for all levels of hockey instruction from the recreational to highly competitive players. Practices for our house programs are mostly held at Chiller North and/or Chiller Ice Works. Travel and select programs also practice at the Columbus Fairgrounds. For experienced/travel players – please see our Travel Hockey page and/or CAHA Northstars Select page. For current CAHA members – schedule information is located under the “All Teams Pages” tab above. House registration for the 2019-2020 season will be available Summer 2019. PUSH FOR SLED HOCKEY DONATE USED EQUIPMENT!! RECOMMENDED CARE FOR YOUR HOCKEY JERSEYS!!! Wash the hockey jersey inside-out. Turn the jersey inside-out, then place it into the washer. Doing so will help to preserve the jersey's fabric and make it less faded. 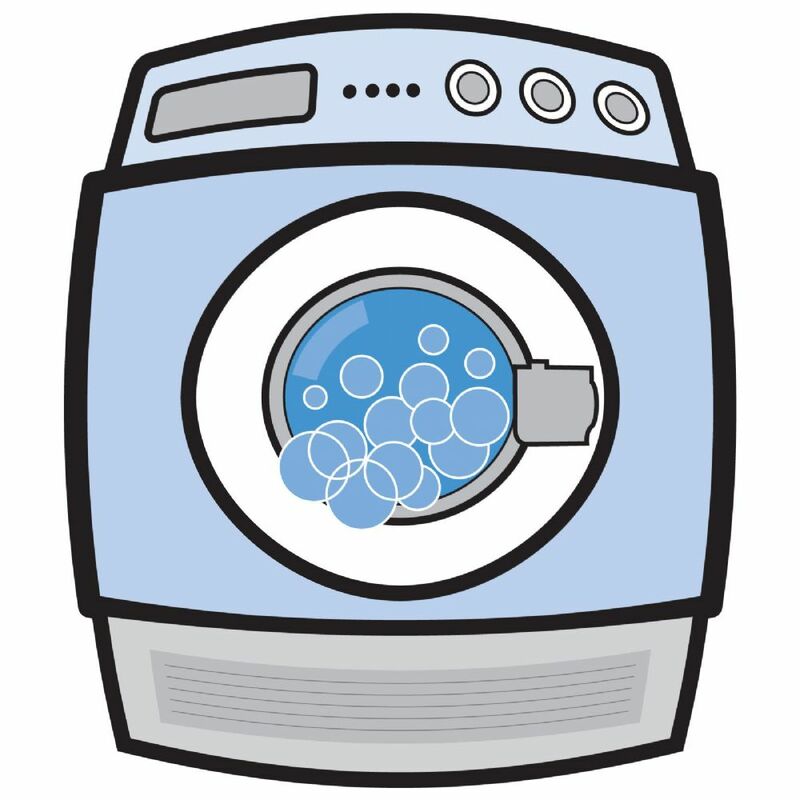 Use color-safe detergent. Washing your hockey jersey is safe detergent negates the fading effects of regular detergent. Purchase color-safe detergent at your local department store. Wash the jersey in a gentle washing cycle and in COLD water. Unlike hot water, the cold water will not shrink the jersey. The gentle cycle of the washer allows your jersey to stay intact. In addition, the gentle cycle will keep your jersey looking soft and feeling comfortable. LET IT AIR DRY DO NOT PUT IN DRYER. Just like the hot water, the hot air of a dryer will shrink your hockey jersey and loosen the adhesion of the silkscreen LOGOS, numbers and names. To properly dry your hockey jersey, put it on a hanger and hang it up in a dry place. If you have a clothes line, you can hang your jersey up outside. It should take at least 45 minutes to air dry. If you have to use the dryer, use only the AIR SETTING and NO FABRIC SOFTENER SHEETS!! Hang up your jersey in a dry place. Once it's done drying, place it in a closet or somewhere that is not filled with moisture. Moisture will make the jersey uncomfortable when you decide to wear it again. Have a great Hockey Season!! Q: What is the name and location of the garage? A: This garage is named the Arena Garage located at 365 Brodbelt Ln., Columbus, Ohio 43215. Please go to http://arenadistrict.com /parking/ for a copy of the parking map. Q: What lane do I use to enter? A: Please use the far right lane when entering the garage. Q: When exiting the facility which lane do you use? Q: How does the new system work during a hockey game or an event? A: The garage will allow access to a limited number of Ice Haus coaches, referee's, players and parents. The ticket provided will give provide 2 hours and 15 minutes ··or" 4 hours and 15 minutes of free parking as allocated and approved by the Chiller staff. Ice Haus parking is based on a first come first served basis. The equipment enhancements allow for a monitored system of Ice Haus patrons specific entrances and exits in order to consistently accommodate the allotment provided. Q: Why will it cost $50 if you stay longer than the allotted free time of 2 hours and I 5 minutes or 4 hours and 15 minutes? A: We are encouraging patrons of the Ice Haus to be mindful of the limited space we have and encourage parking space turnover for the next team, players, and coaches. 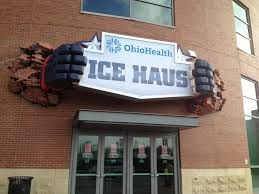 We have also experienced patrons using the free Ice Haus parking accommodation to attend a CBJ game. Q: What do customers do on a non-event day/night? A: On days/nights that the Arena does not have a conflicting event, the Ice Haus Patron will pull a ticket from the machine and enter the parking garage. The patron should take the bar coded ticket with them to the front desk of the Ice Haus and they will validate the ticket for up to 2 hours and 15 minutes "or" 4 hours and 15 minutes of free parking depending on what event or group you are with. Ifyou depart after the free allotted time, you will be charged the daily max of $9.00. As you depart, you will insert your ticket at the exit and the gate will open if you have left within the allotted free time provided. Q: What if my ticket is not scanning? A: Push the call assistance button on the top right of the pay in lane machine and a 24/7 command center staff member will be available to assist you while you are being monitored on an IP camera. Q: What type of payment does the new equipment accept? Q: What if the garage is full? A: You will need to utilize one of the other parking facilities and pay the daily rate. Please go to http://arenadistrict.com/parking/ for a copy of the parking map. Below is information about an important way in which we can support our sled hockey friends. Please look it over and bring in any hockey gear that you are no longer in need of including old bags, skates, sticks - broken or not, pads etc. The gear will be repurposed to help adults and kids who have been disabled by illness, injury, or birth defects. This gear drive will begin on October 1st, 2016. There will be collection boxes at Chiller North, Chiller Easton, Chiller Dublin, Ice Works and the Ice Haus. 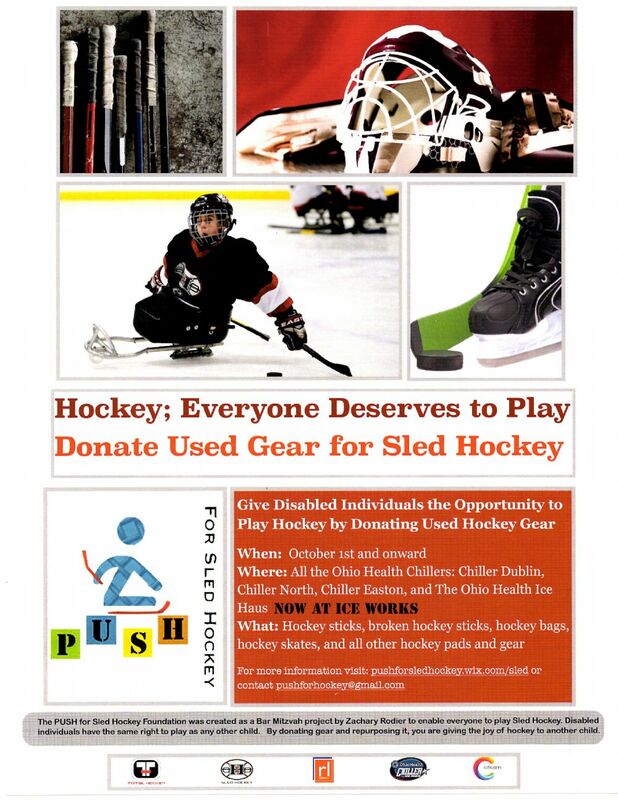 For more information please go to pushforsledhockey.wixsite.com/sled < >. Step 2: Enter in your email address and password (you created this when you registered online). If you don't remember your password, enter your email address and click the submit button (with the password line left blank). Your password will be emailed to you. Step 4: Check the email reminders box for Games, Practices or Both. Step 6: Click on the "Submit" button at the bottom of the page to submit your changes.